This thread is all about shippings. Check out the YGO Wikipedia article called Shipper's List and it gives hundreds of names of shippings and characters... even more than anyone could possibly want! 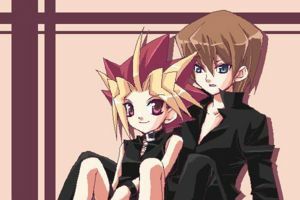 So tell us your favorite couples from YGO and the reasons why. I respect your opinion of Arrogantshipping but Seto and Mai never any any real interaction in the show like Joey and Mai did. So are you basing your love for this shipping simply on their personalities or from what you've seen from the show? Also, judging from their personalities... if they're both so lonely and arrogant, wouldn't they fight all the time? That'd be cute. yeah at the begginning they may fight, but wait wouldnt you be basing serenity or tea and seto on nothing too? do serenity and seto talk? Puppyshipping... as wrong as it is, no one can deny its cuteness. *hugs Red* 'Kay. Go get some sleep while I try and heal my eyeballs. You're all bad people and you should feel bad. We know we're bad people. You don't have to remind us. Mehehehe, I've seen that site. It's chocked FULL of awesomely awesome artwork! And those pictures are also indeed quite AWESOME! Thank goodness, I thinkwe were in desperate need of this thread!